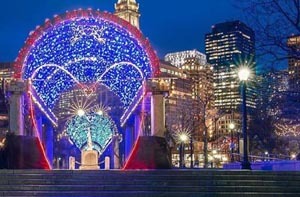 For the second year, the Friends of Christopher Columbus Park are decorating the waterfront trellis with a Valentine's Day theme, beautifully lit up every night. Visitors are welcome to dance to the music as you stroll through the tunnel. You can enter a photo from your visit on Instagram (#FOCCP) for a chance to win 4 tickets to a waterfront sunset cruise.